Bad Robot's Cloverfield turned out to be little more than a serviceable found-footage monster movie built around a Statue of Liberty-sized kaiju tearing through Manhattan, but the mysteries and speculation surrounding its prolonged viral marketing campaign were something to behold. An enigmatic trailer without a title, social-media pages for the characters, and websites built around the fictional brands found in the film created a long line of breadcrumbs for interested parties -- many of whom were already caught up in the puzzle-solving of LOST's missing pieces -- to follow until its release. Dan Tractenberg's 10 Cloverfield Lane, a parallel spinoff set in the same universe, does almost the exact opposite, where instead of a year of promotional nudges and winks, a surprise trailer emerged mere months before the film was slated to arrive in theaters. The difference in approaches to the marketing reflects the differences between the films themselves: 10 Cloverfield Lane keeps its scale small and its intentions cerebral, producing a well-crafted paranoia thriller with apocalyptic science-fiction in its veins. Instead of jarring, loud interruptions made up of shaky-camera found footage, 10 Cloverfield Lane maintains a steady visual focus while depicting a group of survivors holed up in a fallout shelter following a catastrophic event. Overseeing the bunker is Howard Stambler (John Goodman), a controlling and intimidating ex-military man who forces his two guests, Michelle and Emmitt, to adhere to his rules if they're going to stick around -- and they're going to stick around, whether they want to or not. Michelle, injured and fresh off a marital breakup, grows suspicious and fearful of Howard's motives and contemplates the truth behind the hazardous state of the world above ground. Emmitt, who knew Howard before the event, exhibits less concern due to Howard's willingness to let him wait out the lingering effects of the disaster. There's one constant among them: the only information they're going by is Howard's deduction about the state of the toxic atmosphere, and the length in which they'll have to stay underground before everything's safe. 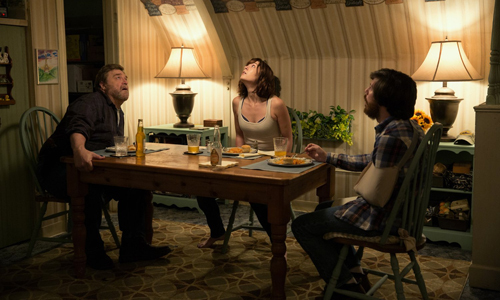 At first, 10 Cloverfield Lane began as a project called "The Cellar" that didn't have anything to do with Bad Robot's universe, something that makes plenty of sense considering the ambiguous, paranoid atmosphere and post-apocalyptic theorizing going on between the bunker's residents. Attaching it to Cloverfield adds an intriguing -- if unnecessary -- layer to the experience, though, that takes on different meanings depending on whether someone does or doesn't know about the first film's world-building. Without that context, mystery and suspicion loom over Howard's authoritative explanations about the global state of affairs, where he spins a cogent but ominous tale of warfare, weapons of mass destruction, and hopelessness for anyone who isn't in a bunker like his. Knowing the reality of what's going on in New York, on the other hand, replaces some of that vagueness with analysis of the things Howard's saying about the dangers and the fallout. 10 Cloverfield Lane works splendidly on its own regardless, and it's largely because of what it sets out to do with the murkiness of "the truth". Thus, the bulk of 10 Cloverfield Lane occurs within the confined, shaky corridors of Howard's mildly homey bunker away from the toxic atmosphere, adorned with minimal creature comforts that make the power surges and intermittent tremors in the ground easier for its inhabitants to bear. Smart, polished set design squeezes the most that it can out of the film's modest budget, creating a space that really feels like a fallout shelter designed with years of isolation in mind, with just enough entertainment around -- board games, reading material, movies -- to keep the metal box from seeming like a spruced-up prison. Combined with Bear McCreary's beautifully off-kilter score and John Cutter's cinematography that relishes the bunker's dim lighting and sunken depth, 10 Cloverfield Lane generates a uniquely alarming mood as Michelle and Emmitt adjust to their new surroundings, persuading those watching to consider whether their living conditions may or may not be as they seem. The effectiveness of 10 Cloverfield Lane swings on the complexity of Howard's nature, placing the bulk of the pressure on John Goodman's burly shoulders. Much like his character's self-designated call to duty, Goodman's up to the task, producing an understandably fearful individual with both sympathetic and unnerving personality traits. Director Tractenberg wants those watching to be uncertain about what Howard wants and why he's so adamant about his rules, and Goodman's fluctuations in temperament -- volatile and controlling in one moment, concerned and misunderstood in another -- are what keep those motivations in a compelling state of flux throughout. Mary Elizabeth Winstead embodies the wide-eyed, fraught, yet crafty victim similarly to how she does in The Thing, while John Gallagher musters a convincingly earnest Louisiana laborer who's more easily persuaded than Michelle, both of whom capably adjust to Howard's dominant flare-ups and seemingly good-intended restriction of freedom. Neither possess very deep character traits, but that's not required for the roles they fill. Ominous philosophical small-talk, periodic flickers of light and earthen rumbles, and scattered clues about Howard's true nature -- as well as how Michelle came to live in the bunker -- all form into a mystery worth unraveling in 10 Cloverfield Lane, posing questions about trust and lesser evils in the process. These are carefully constructed diversions from director Tracterberg's ultimate intentions, though, which manifest in a hazardous and explosive final act, revealing precisely how this tense underground psychological thriller connects with Bad Robot's pseudo-kaiju flick from nearly a decade prior. Saying any more than that, vague as it may be, borders on spoiler territory, and the surprises waiting on the other side of the door are worth preserving for the exhilarating conclusion telegraphed by Tractenberg. While it may not have been originally devised with this purpose in mind, 10 Cloverfield Lane illustrates what's possible when a sci-fi spinoff is driven by contained, clever writing that'd succeed regardless of its recognizable namesake.